BOSTON (FinalCall.com) - “We need to know who they are and get them off the streets,” Jackie Hurley told reporters standing in front of the makeshift memorial for the victims of the Boston Marathon bombing that killed three and injured over 180 people. She didn’t know a few hours later law enforcement would exchange shots in Cambridge, Mass., home to Harvard University, with the Tsarnaev brothers, 26-year-old Tamarlan and 19-year-old Dzhokhar. Officials say the older Tsarnaev was killed during the exchange, while his brother escaped, only to be captured around 8 p.m. April 19 after a massive manhunt in East Watertown, Mass. Dzhokhar Tsarnaev was charged in his hospital room April 22 with using a weapon of mass destruction to kill—a crime that carries a possible death sentence. Mr. Tsarnaev, 19, was accused by federal prosecutors of conspiring with his older brother to set off the two pressure-cooker bombs that sprayed shrapnel into the crowd at the finish line, killing three people and wounding more than 180. The criminal complaint containing the charges shed no light on the motive for the attack. Mr. Tsarnaev was listed in serious but stable condition at Beth Israel Deaconess Medical Center, unable to speak because of a gunshot wound to the throat. In outlining the evidence against him in court papers, the FBI said Mr. Tsarnaev was seen on surveillance cameras putting a knapsack down on the ground near the site of the second blast and then manipulating a cellphone and lifting it to his ear. 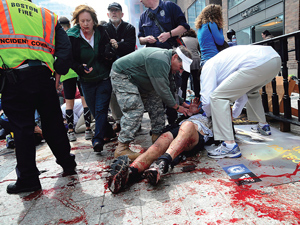 After the first explosion went off about a block down the street and spread fear through the crowd, Mr. Tsarnaev—unlike nearly everyone around him—looked calm and quickly walked away, the FBI said. Just 10 seconds or so later, the second blast occurred where he left the knapsack, the FBI said. The brothers are ethnic Chechens from Russia who have lived in the U.S. for about a decade. Investigators are focusing on a trip the older brother made last year to Chechnya and Dagestan, in a region of Russia that has become a hotbed of separatist politics and Islamic extremism. Mr. Tsarnaev was charged with using and conspiring to use a weapon of mass destruction against persons and property, resulting in death. The boys’ mother and father, however, have emphatically denied that their sons were terrorists. The mother said the FBI had monitored her son Tamarlan and “controlled” him. But suspect Tsarnaev is a naturalized U.S. citizen, and under U.S. law, American citizens cannot be tried by military tribunals, White House spokesman Jay Carney said. Spokesman Carney said that since the Sept. 11 attacks, the federal court system has been used to convict and incarcerate hundreds of terrorists. In its criminal complaint, the FBI said it searched young Tsarnaev’s dorm room at the University of Massachusetts- Dartmouth April 21 and found BBs as well as a white hat and dark jacket that look like those worn by one of the suspected bombers in the surveillance photos the FBI released a few days after the attack. Fifty-one victims remained hospitalized April 22, three of them in critical condition. 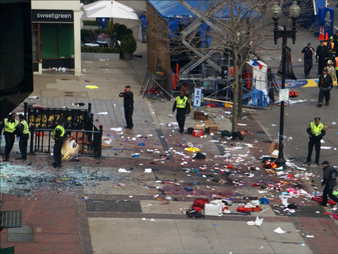 The memorial was set up at the corners of Boylston Street and Berkeley Avenue, three blocks from the marathon finish-line and the site of the bombing. “It is a little more shocking to finally have a face to those who committed this act—they look like they are my age,” Ms. Hurley said. Ms. Hurley and some colleagues, all wearing green and gold running jackets with a Boston Marathon logo, exchanged their thoughts April 18 with reporters who gathered at the memorial. 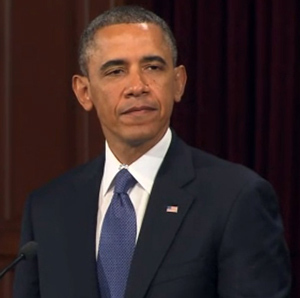 President Obama speaking at a memorial service in Boston, Massachusetts. “We are resilient,” Mr. Blue said. A typical day in Roxbury The talk on the streets in the predominately Black neighborhood of Roxbury concerned the massive manpower used to hunt down the duo. The manhunt locked down Boston and neighboring townships. Massachusetts Deval Patrick issued a little used “shelterin- place” order around 9 a.m. April 19 that required Bostonians to stay in their homes. According to the IHS research forum and the RAND Corp., the one-day shutdown may have cost Boston $250 million to $333 million. Some economic experts predict the cost to Massachusetts taxpayers for law enforcement overtime could reach into the millions. “I observed Black people in Roxbury going to the mall, shopping—talking on the street corners—attending to their daily business,” Sadiki Kambon, a grassroots activist and founder of the Nubian Leadership Circle told The Final Call. “I felt comforted with the knowledge that the Boston police were so focused on the bombing suspects in Watertown, that it minimized chances of my being ‘racially profiled’ and arrested for at least one day,” Mr. Kambon wrote on his blog. The T, Boston’s train system, was closed during the stay-inplace order. He felt concern for the elderly like his 87-year-old grandmother who lives in Roxbury. She often needs medical assistance and the inability to easily move about in the city worried him. The stay-in-place order concerned Disaster Preparedness activists in Boston and New York City. “I have been talking about these types of things for the past 10 years, and our people aren’t listening,” Minister- General Ahmad told The Final Call during his “National Hollah Black” radio show on Boston’s WRBB-FM radio. If the worst case scenario had been in play, and the shutdown lasted into the weekend, Blacks were not prepared and is why they were in the streets shopping, he said. “For Black people it is a sense of denial in spite of all that is in your face,” said Rudolph Muhammad of Ready Up America and Ready Up Now, grassroots preparedness organizations based in New York. Our people are looking for the big bang disasters, not something such as what happened in Boston at the Marathon, Mr. Muhammad said. As for the 117th running of the Boston Marathon, Black people don’t go downtown to watch, it’s Patriots Day, and Blacks just stay home, Mr. Crawford said. “One of the brothers in our crowd used to run in the marathon, and we would go down to Boylston St., and after he passed by, we would immediately head back to Roxbury,” Mr. Crawford recalled. While local Black Bostonians may not have participated, the 75,000-member National Black Marathon Association had 10 to 12 members running, according to organization president Tony Reed. “My wife and I were standing at the finish line waiting for our daughter when we decided to go to the food court just before the explosions occurred. None of our members were hurt,” he told The Final Call. She has been running 18 miles every Saturday since January to get ready for the 26.2 mile Boston Marathon. She is vowing to come back for the 118th marathon, if she qualifies.